Rick Begun is a Certified Professional Dog Trainer and a graduate of the world recognized National K-9 Training Academy. He has been specializing in behavior management and obedience for nearly 50 years. 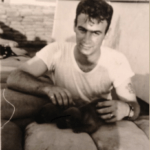 Rick’s first exposure to formal training began in Vietnam, while stationed with a sentry-dog unit. Upon returning to the Washington, DC area, he obedience trained his first German Shepherd under the guidance of Bob and Janice Ward, certified professional dog trainers. Through years of hobby training, research, and personal experience Rick became a professional trainer and developed a system of connecting with dogs on multiple levels. They respond to him almost immediately, and he will teach you what you need to know to do the same for your dog. He will also make sure you have a chance to apply what you are learning throughout the process. In addition to serving as a volunteer temperament evaluator for the Montgomery County SPCA, and The Montgomery County Humane Society, Rick is also an active member of many professional training organizations! Over the years he has developed several training programs, each designed to achieve specific results. His approach is not one size fits all, but rather an individualized program customized for each dog.